nic's post just reminded me of this photoshop adventure i took a few months back and forgot about. first i read this article on the Most Attractive Face as averaged out by like a billion humans. SNOOOOZE! but whatever. 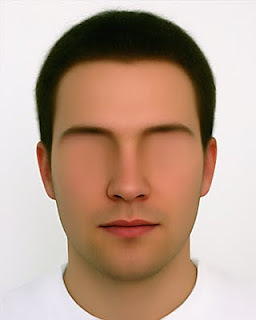 but then i thought if you had to date this guy, but he had one facial feature completely missing, which version would you pick? i don't have to choose because i'm the blogger. i bet you'd get used to it. I guess i'd choose eyebrows, he could get them tattooed back on.